Hanif, Adam. “$50 fine for buses entering airport ‘unfair’“, The Brunei Times, 2 Mar 2013. Date accessed Aug 2013. Koo, Jin Shen. “Bus drivers fined for dropping off passengers at undesignated areas, The Brunei Times, 6 Mar 2013. Date accessed Aug 2013. “An element of truth in YouTube blogger’s scathing travelogue“, Letter to the Editor, The Brunei Times, 24 Aug 2013. Date accessed Sep 2013. The Brunei International Airport is the primary commercial airport in Brunei, and is the major entry point for many travelers. At the time of our visit, the airport had recently completed Phase 1 (Car Park) of the expansions and renovations. We started from the Arrival Hall of the airport, trying to find out if information is clear for visitors. 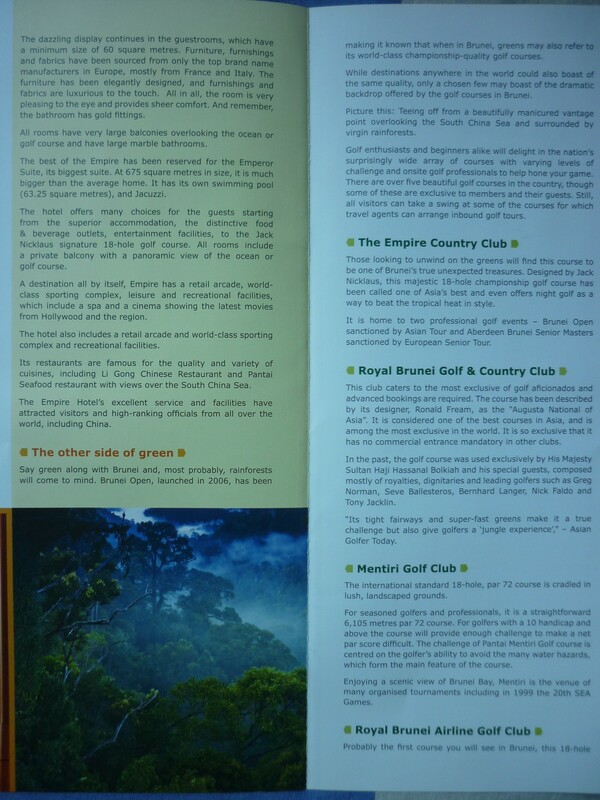 Below are leaflets and brochures (left, centre) available at the Brunei Tourism counter at that time. 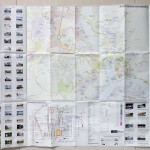 Currently, at the new information counter, maps (right) are provided by the Survey Department. The location of money changer or currency exchange services was quite clear. There is signage at most areas of the airport, even during the renovations. There were none close by the Arrival Hall. In fact, you have to go upstairs to the Departure Hall to find one. There was a tourist information counter located near the car park, a considerable distance from the Arrival Hall. It was closed. 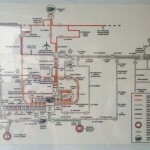 There is no map of the airport itself, except one which appeared to be a plan showing areas of renovation. No free Wi-Fi/internet provided for airport visitors. At 9.00 am, shops were still closed. They didn’t sell any prepaid mobile lines. Public transport in Brunei is often not used by locals, who tend to own their own cars. An important thing to note, when getting into the mind-frame of tourists, is that visitors to Brunei do not all have their transport arrangements sorted out for them. We were careful not to look up any transport information in advance, preferring to find out if such information is easily available to tourists. 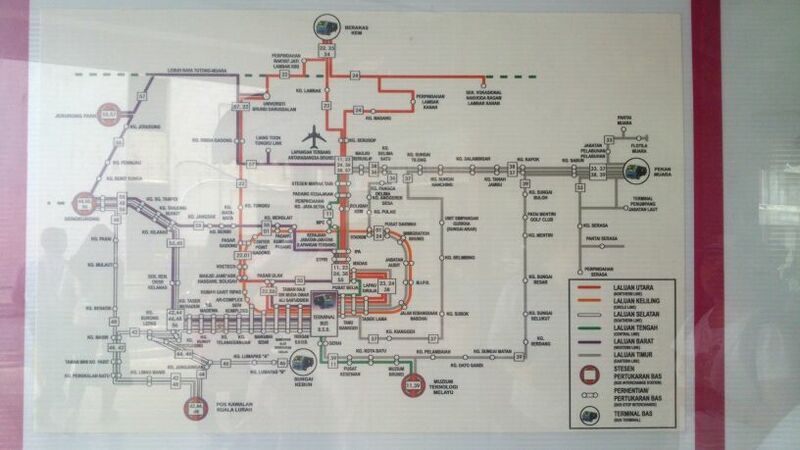 Below is a map of bus routes (centre) at Bandar Seri Begawan bus terminal and taxi fares (right) from Brunei International Airport. The taxi driver at the airport spoke English, and was friendly. The bus stops we used were shaded, provided seating, and were close to a shopping area. The bus stops were seen to be regularly used by other people. The bus ride was pleasant, relatively speedy. There was a good view of the new Prime Minister’s Office grounds on the way. This particular bus was not crowded. 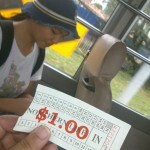 The bus fares were much, much cheaper than taxis. 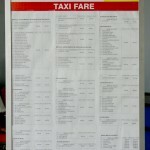 Taxi prices seemed costly ($20+). Signs regarding the location of buses were inconsistent. 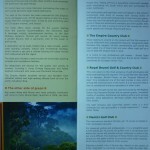 Travel brochures only showed places of interest but no addresses or directions. 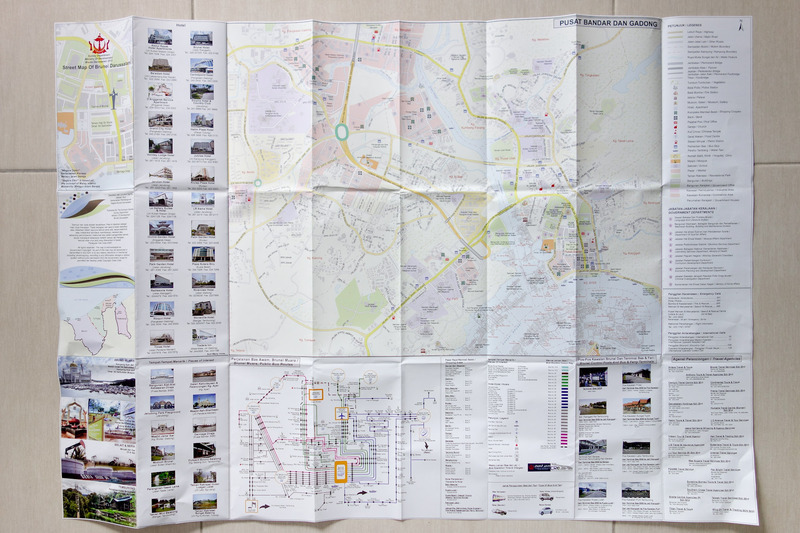 There were no maps showing the location of possible tourist destinations, especially in relation to the airport. The security guard at the airport answered in Malay, and thought we were looking for the buses provided for tourists on package tours. There were no signs at the airport indicating the pick-up points for the public buses. The area outside the Airport was not pedestrian-friendly. No signs or maps. Road signs are only useful if you know the names of the areas. The path from the Airport to nearest bus stop involved crossing busy roads, and walking under a bridge where there is lots of rubbish. There are few pavements for walking, and no zebra crossings. The bus stop had no indications of times or destination. There was no information at all. We found out later that we had been waiting on the wrong side of the road! Waiting time for the bus was long (~20-30min). 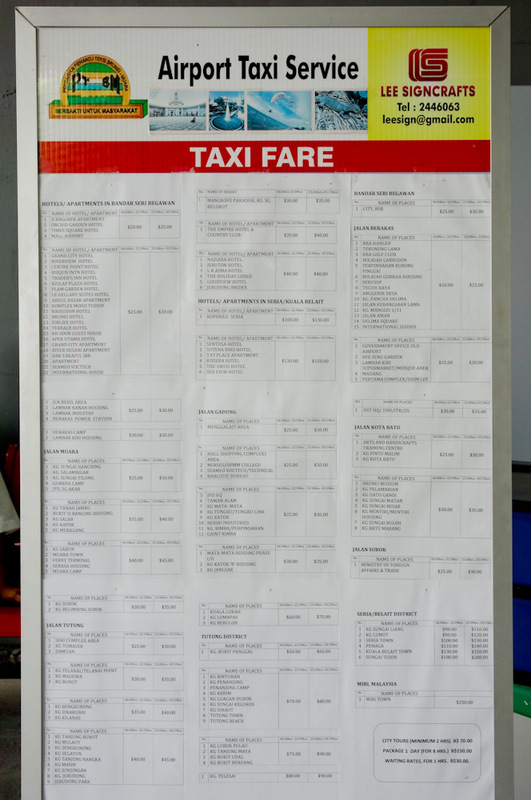 The existence of cheap, illegal taxis ($1 per passenger). They approached us before the bus arrived. Bandar Seri Begawan, the capital of Brunei, is the home of Brunei’s main landmarks such as Kampong Ayer and the Sultan Omar Ali Saifuddien mosque. It is not, however, a favourite with locals for shopping and dining. The Gadong, Kiulap, and the Times Square areas are far more lively with their wider variety of eateries, shops and cinemas. Nevertheless, due to tourism marketing or just lack of up-to-date visitor information, tourists tend to end up in Bandar Seri Begawan. In the final stage of our journey, we arrived at the bus station in Bandar Seri Begawan (left). 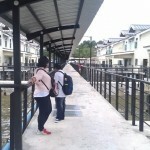 From there, we made our way to the final destination, the Kampong Ayer Cultural and Tourism Gallery (centre) and walked around the housing close by (right). There was an Indonesian restaurant nearby the bus station, for a quick and cheap brunch. 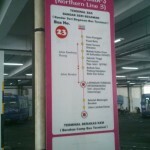 A man at the bus station was helpful and explained how to get to Kg Ayer. He was not a local. 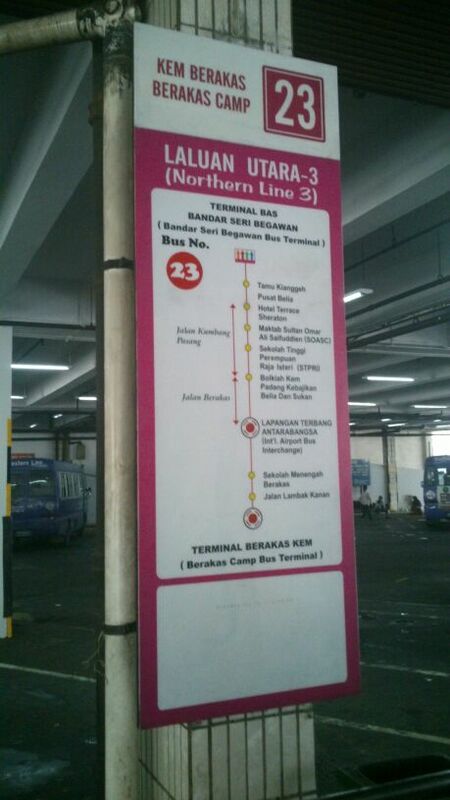 The bus route information at bus station indicated some tourist destinations that are part of the bus routes. 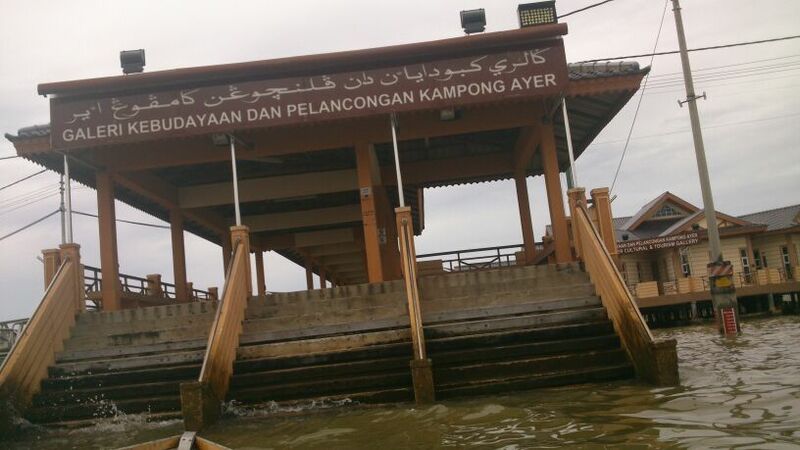 Kampong Ayer was quite pleasant to walk around in. 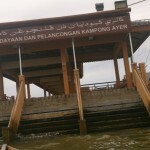 The boat operator bringing us back from Kg Ayer gave us an option to have a more “thrilling” high-speed ride, and only charged at normal price ($0.50). 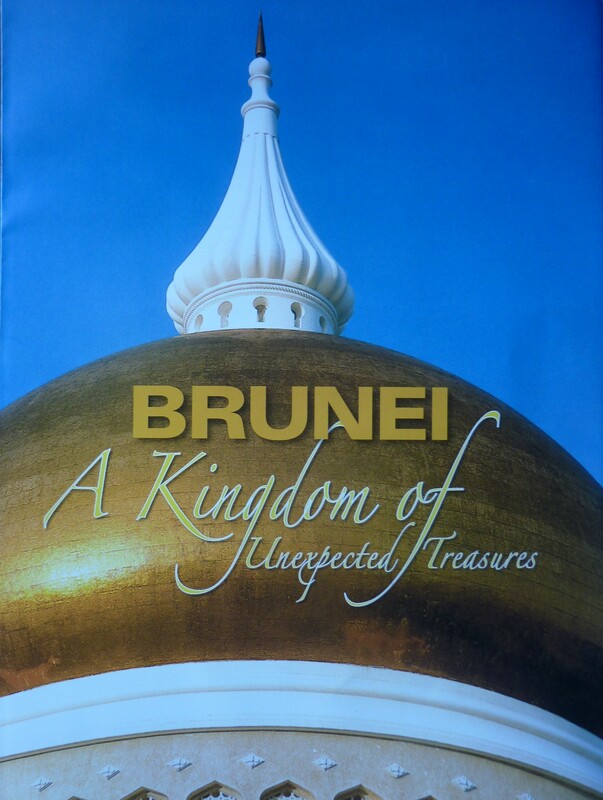 There was no indication at the bus station or its immediate surroundings that you are arriving in Brunei’s capital. No images, no large signs. It didn’t help that the bus route (which, fair enough, wasn’t a tourist bus) did not pass by more obvious landmarks such as Royal Regalia, the clock tower, Taman SOAS, SOAS mosque. No maps showing geographical location of tourist destinations, especially in relation to the bus station. Boat operators hassled us with their services while we walked alongside the waterfront. 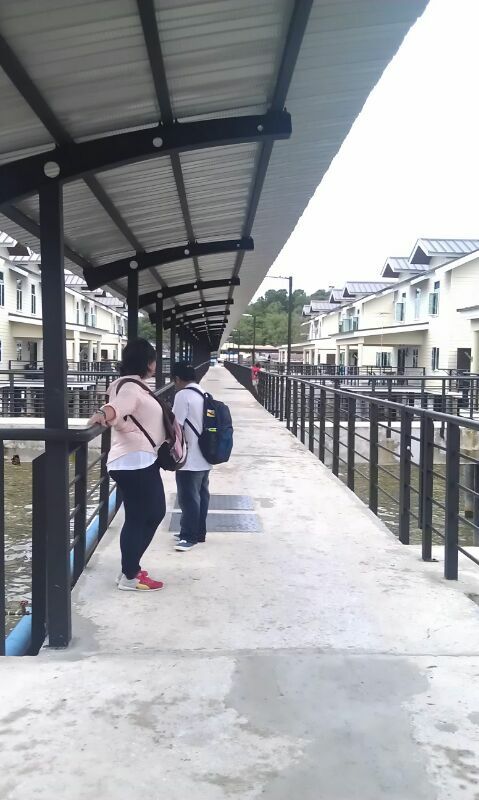 They did not wait at a proper jetty. 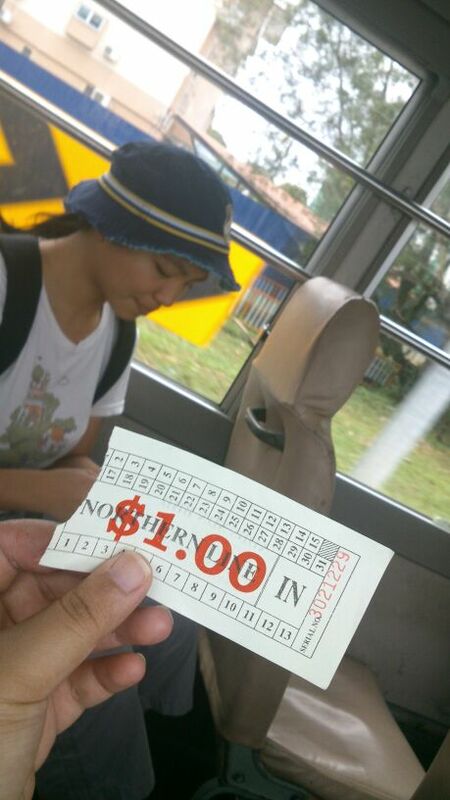 The prices of boats were not consistent, ranging from $0.50 to $10.00. Kg Ayer Gallery was actually closed at 11.00 am on Friday. The boat operators did not know or did not mention this, when we asked to be taken there. This was a one-off! We encountered closed counters, contradictory information, and a breezy bus ride, but we are aware this does not generalise the experience. 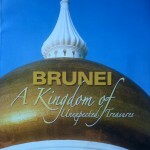 In this experiment, we took the point of view of tourists who (1) flew in to Brunei (2) are not relying on package tours. We also headed straight for our desired destination instead of getting accommodation first, so we do not know if hotels are perhaps more helpful in providing information to tourists. As Bruneians, we already know where everything is. There was already an unconscious bias to risk leaving the airport to find the nearest bus stop. We didn’t ask other airport visitors, including locals and actual tourists, for help. We also weren’t offered help, but to be fair, this was probably because of our cameraman following us around. To watch the video and read our conclusions, read the main post here.